When Renee, a pale golden beauty of the French upper middle class, was seduced and found herself pregnant, she accepted the name of Monsieur Saccard in exchange for her personal fortune . . . But marriage with this unscrupulous financial genius, while it brought unheard of luxuries, left Renee a restless woman, unsatisfied, waiting for one passionate experience that would give meaning to her life… until Maxime came along. 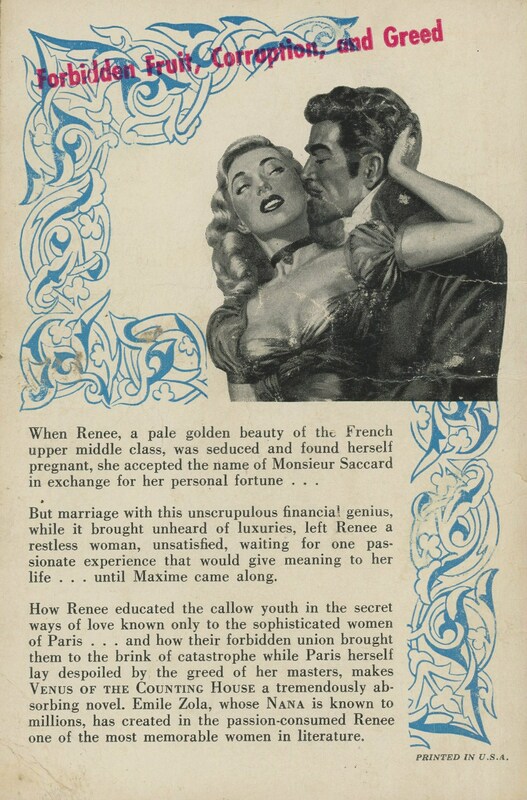 How Renee educated the callow youth in the secret ways of love known only to the sophisticated women of Paris… and how their forbidden union brought them to the brink of catastrophe while Paris herself lay despoiled by the greed of her masters, makes Venus of the Counting House a tremendously absorbing novel. Emile Zola, whose Nana is known to millions, has created in the passion-consumed Renee one of the most memorable women in literature.